Mackeeper presented the results of their Educational program in numbers. Mackeeper presented the results of their Educational program in numbers and included that information in infographics. See this link. Over the past 6 months MacKeeper has given away more than 700 licenses to students and educators from around the world; more than 100 licenses were granted to computer labs in schools and colleges from Denmark, New Zealand, Peru, India, Japan, and Latvia. MacKeeper motivates and inspires their customers to learn more about their Mac computers by conducting educational webinars. During the last year, MacKeeper experts conducted 9 live webinars with more than 2,000 attendees from all over the globe. “Considering the fact that an average Mac user is not that tech savvy and uses their Mac primarily for browsing and educational purposes, MacKeeper’s in-house tech professionals offered to help users to upgrade their computer skills. Our Apple Certified experts have spent a combined 540 minutes sharing their Mac tips, tricks, and hacks, which can help to turn every newbie into an advanced user,” according to Volodymyr Diachenko , MacKeeper’s PR Representative. 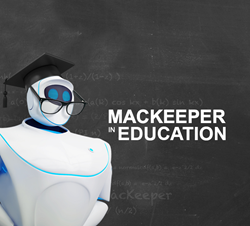 In the coming year the MacKeeper Educational Initiative is expecting to rise to the next level, expand through closer cooperation with US colleges and communicate directly to students. The users expect technology to simply work, that’s why MacKeeper representatives are going to run demo tests of new MacKeeper versions in campuses to better understand the needs of Millennials. “We want to keep computer labs in every school and college optimized with free MacKeeper licenses. Even maintaining only one computer requires time and certain skills. Imagine that you have a computer lab with 20 Mac computers, which are simultaneously used by 20 students. One teacher cannot control the actions of every student, but MacKeeper can considerably simplify the entire process: teachers can configure the security options according to their needs and control the access level to specific sites; with the automatic cleanup tools Macs will always be maintained and optimized. Moreover, together with the security and optimization package, the users receive customer support that will handle any software-related issues 24/7,’ says Alexander Kernishniuk, MacKeeper’s CEO.